As it crept up behind it on the sly. ‘Come along, don’t be shy. That’s it for today. Sorry for so many. 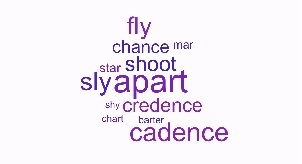 This entry was posted in blogging, Challenge, word prompt and tagged Sunday Whirl, wordle #390. Bookmark the permalink. This is very well done on a difficult selection of words I am still wrestling with! Thanks. I think it makes sense………..
A superb job with this difficult prompt!